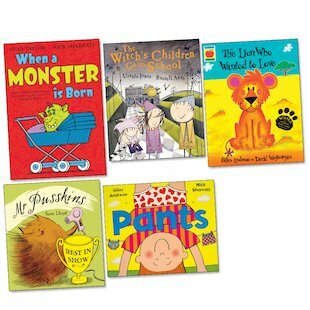 Funny picture books which have stolen the top prizes at the UK’s best book awards. Indulge yourself with the crème de la crème! In this pack you’ll find stories which have won the Roald Dahl Funny Prize, the Red House Award, the Nestlé Smarties Gold Award and other top prizes besides. What’s more, you’ll meet all kinds of crazy characters in comical capers guaranteed to tickle your funnybones. Get your chuckles on with quality comedy which will lift your mood to the max!